When we were in school, we would eagerly wait for the vendor’s call: kaale kaale phalse, sharbet wale phalse, thande meethe phalse, bade raseele phalse. And this call would make kids in the neighbourhood run out in the scorching sun during the summer vacation to buy a handful. The phalsa fruit has very little to chew on. The purple fruit—around a centimetre in diameter—is sweet and sour, and has only a thin layer of greenish white pulp over its seed. What surprised me the most was that the vendor’s basket would have just a few fruits. I could not visualise the business sense of roaming around with a nearly empty tokri (basket). We used to make up stories that the phalsa shrub was full of thorns and the vendor was a hero who braved the thorns to get the fruit. But in reality, the phalsa shrub is thorn-free. And the reason he used to bring it in small quantities is because the fruit ripens in small batches; they have to be handpicked individually, and, have a short shelf-life. Phalsa, a shrubby tree, belongs to the Tiliaceae family and is said to be the only edible variety in this family of 150–odd members. Believed to be indegenous to India, it is also grown in Nepal, Pakistan, Laos, Thailand and Cambodia. Interestingly, the tree is considered a weed in Australia and the Philippines. The scientific name of the tree is Grewia asiatica, named by the father of modern taxonomy, Carl Linnaeus, in the honour of Nehemiah Grew, the father of plant anatomy. But the global linkage of the fruit ends here. The phalsa fruit is very delicate; it cannot be transported, and, has to be consumed quickly and locally. Cultivation is restricted near big cities which provide a ready market. That’s why it sells at a high price during the few weeks it is available—in May-June. It is often grown in mango and bael (Aegle marmelos) orchards as fillers. During the summer months, the fruit and its sherbet (juice) are said to have a cooling effect. Overripe fruits are perfect for making sherbet (see recipe). According to Ayurveda, the juice can reduce the burning sensation during the summer season and can be used to treat fevers. An appetiser, it is good for the heart, treats urological disorders, and is anti-inflammatory. Modern medicine has found that it can stablise sugar levels among diabetics and offers protection from radiation damage. The fruit also has calcium, iron, phosphorus, vitamin B, C and A. Many die-hard fans even chew and consume its hard seeds; the seed oil is rich in linolenic acid, an essential fatty acid. Unfortunately, the shrub is not popular among farmers because very little is known about its cultivation. A few studies have shown that the application of manure and fertiliser can increase yield, but it is still only around 10 kg per tree per year. It is said that pruning can increase yield, but the extent of pruning needed for optimum results has been not studied. 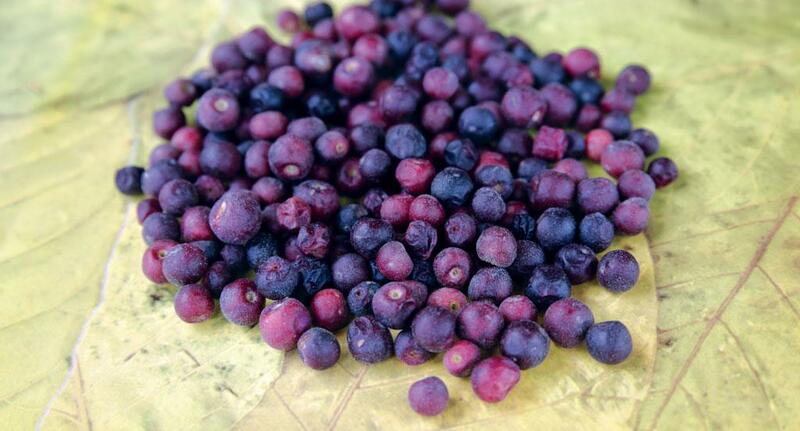 As of now, phalsa is cultivated only in small quantities in Punjab, Haryana, Gujarat, Maharashtra and Bihar. However, the shrub should be popularised because it can grow in poor soils; it is drought-resistant; and, can survive in high temperatures. It also prevents soil erosion and can be used to break the flow of winds. Apart from the fruit, its slender branches can be used to make baskets. The bark has a mucilaginous compound—a gelatinous solution—which can be used for the clarification of sugarcane juice, thereby reducing the application of chemicals. The Council of Scientific & Industrial Research’s (CSIR) Indian Institute of Integrative Medicine recently introduced the cultivation of the tree in Jammu region as it was disappearing from the area. They have even developed a technology to produce a health drink, which is now sold on the pilgrim route to Mata Vaishno Devi Temple in Jammu and Kashmir. Phalsa is one among the many rare varieties in India’s fruit basket. Wash the fruits well. Use a blender to separate the pulp from the seeds. Strain through a sieve repeatedly to extract the maximum amount of juice from the fruits. Add cold water, gur, black salt and roasted cumin according to taste. 200 g of fruits would make about four to six glasses of juice.